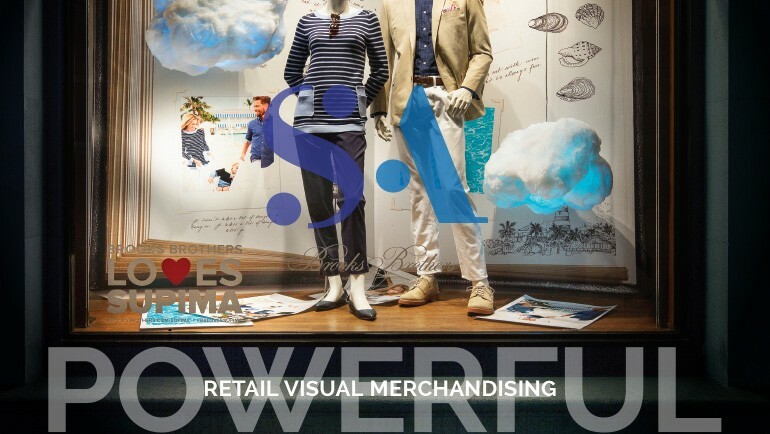 Creating successful Retail Visual Merchandising displays isn’t an exact science; it’s an art, and Sandy Alexander excels at conceptualizing and producing innovative displays. With premier color management across all printing platforms and substrates, any idea for a display is a great idea when partnering with us. 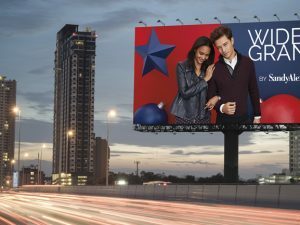 Our Retail Visual Merchandising division focuses on building customer relations by creatively encouraging customers to visit a physical store location, therefore yielding a better, more meaningful, experience than shopping online. In order to achieve positive in-store reinforcement, retailers must first create this unique experience, but how does one do so? 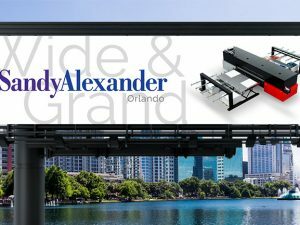 That’s where the experts at Sandy Alexander come in! Adding dimension in interactive pieces to a retail display will yield better point-of-sale results for retailers while providing a fun, enticing experience for the customer. 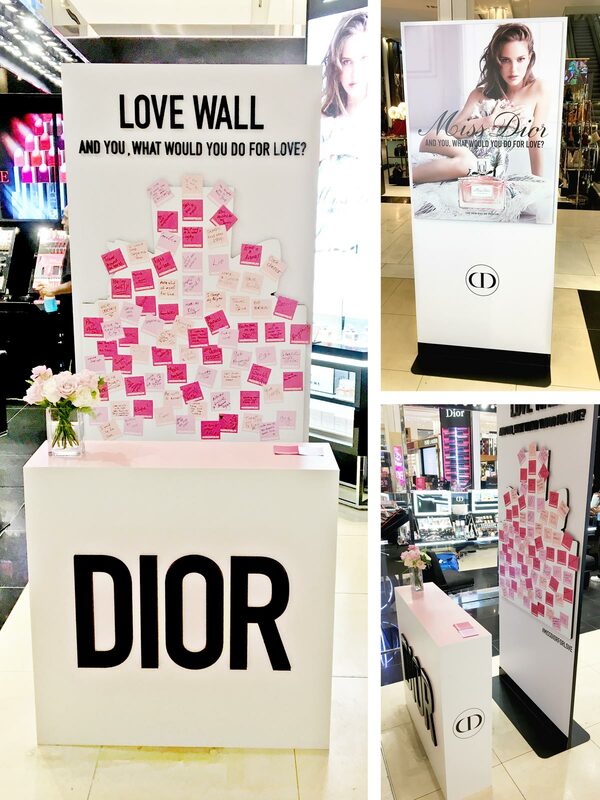 As an example, this recent Dior display by Sandy Alexander fully utilizes customer engagement to drive their campaign as an interactive in-store display piece. Most people are familiar with the famous lyrics “I would do anything for love” and this well-known familiar concept breathed life into the idea of encouraging passing customers to write post-it notes about what they would do for love, then stick the notes on the board. A branded hashtag was also created and implemented to allow customers to share their personal love notes on social media. In another eye-catching piece for Brooks Brothers, the Sandy Alexander RVM team designed and fabricated a diverse set of window displays featuring billowy cotton clouds accented with colorful LED lighting. Staged with the well-dressed mannequins in front of an oversized hand-written journal backdrop, the clouds were made from Supima cotton, the extremely durable and versatile material used in their products. The extra dimension of changing colors made the display even more attractive to passing by customers. Some brands are adding sustainability features, an environmentally friendly philosophy popular in today’s marketplace. 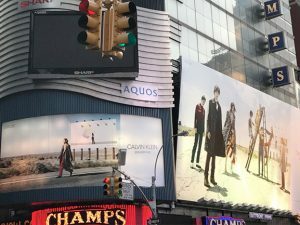 In fact, creative and sustainable solutions have recently been designed and installed by Sandy Alexander in Saks OFF 5TH stores nationally. The concept was to have customers donate old blue jeans which in-turn could be recycled into home insulation material. 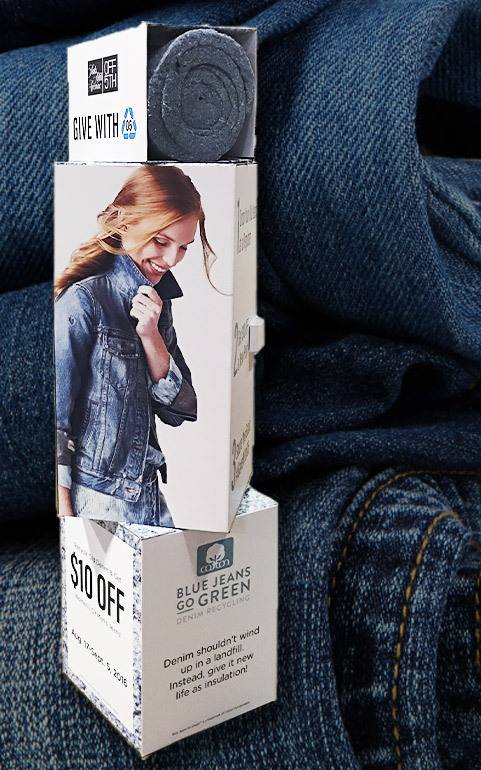 The “Blue Jeans Go Green” initiative distributed the material to organizations like Habitat for Humanity, amongst much more.